Jack: I’m a design student in Ireland and I am currently researching different contemporary art movements and I came across yours, i.e Toyism. This movement is so interesting to me. I’m still learning more about it, but I was wondering are there any online books or journals or newspaper articles I can access to help me along. How is Toyism perceived? One other question I had was regarding the toyist group. Is the movement exclusive to the current 26 member or do/can other artists create their own groups? This book – Toyism Behind the Mask – tells the story about toyism and its influences and history. Jack: Another question that popped into my head was regarding Toyism with performance. Is that a possibility? Has anyone in your collective explored that medium, or would it defy the manifesto (which I’m incredibly curious about). I’m sure that I’ll have more questions in the future, I very much hope that I don’t bother you with them I think what you guys are creating is so wonderful. Jack: It’s a shame to hear about your manifesto, I’m stumped by the code as I’m sure many others are. May I ask why the manifesto is secret? Its very different to the way other art movements function, but of course that’s probably the point. It would be great to see your guys’ work in person. I don’t want to bombard you with questions but I have two more, I’m sorry. Hope you don’t mind. They very name of the movement and its tagline ie. 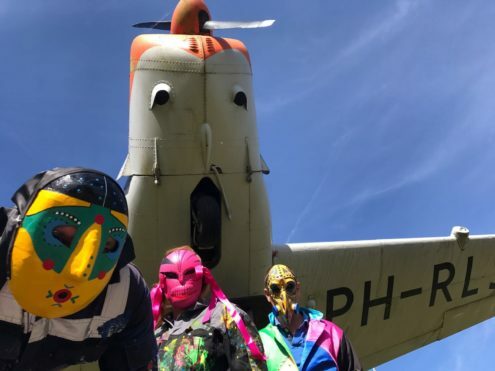 “The toyism art movement seeks to plug into the experiences of children.” It seems to suggest some form of childlike mindset in the art and philosophy. Could you shed some light on that at all? And lastly I wanted to ask about the masks and pseudonyms. I was wondering if there was any reasons behind what name you choose. Do the names Dejo, Gihili, Qooimee etc. have any meaning or are they gobbledygook? On top of that, do your masks design have any relevance to your character or personality? This is all so incredibly helpful thank you again. Dejo: Good to hear we are of great help to you. Yes about the manifesto and why it’s secret. The answer actually is quite simple. You may consider the manifesto as a well-protected recipe. Take Coca-Cola for instance. Everybody knows the taste, but nobody knows exactly what ingredients are inside and in what proportion. It’s secret and it will be probably till the end of days. The same is with our manifesto. Why make it public? So people can do with it what they want. No, our ingredients are pure; all the toyists know how to deal with them. Making it public, the pureness of this movement is gone, sure! We live in a world of copycats. We are not following a trend, we are setting one. Many people like you, consider our movement different to other movements in the past. This is the biggest compliment people can give us. Yes, we are different. But in a good way! The toyism art movement seeks to plug into the experiences of children, while indirectly also appealing to all adults. Children are not infected and projected by adult topics and therefore they are uninhibited to watch toyism. Children are attracted to colors and recognizable shapes. But they don’t understand our stories yet. This is the part when the adult part comes in, or even better said the adult who is capable of understanding – reading – our art. Toyism is not that simple as it may show. Many people tell us that their first experience is completely different then the second one. The second meeting with toyism art shows a lot more of what is behind. You have to experience this for yourself, only then you understand what I mean. Toyism paintings are much more detailed then you see on a computer screen. A painting in the size of 100 x 100 cm takes about one month! It has between 8 and 15 layers of paint. Toyism is all about technique and craftsmanship. It’s not for everyone. We paint our canvas like a construction worker is building a house. Color on color, stone by stone. Unfortunately you can’t see this on the web. Our toyist names are complete made up, fantasy. The only thing is that the name must not be found on Google in the beginning. If the name is original and people look us up on the web, they will find toyism. Who else has a weird name like that 😉 The pseudonym together with the puppet and child photo is the way we present ourselves. The mask has no meaning what so ever. Most masks are changing all the time. Mostly after a big project we put our masks in an auction for a good course. My blue mask resembles me now for quite a period of time. But I am also wearing other masks to make people confused. We play, therefore we are. This is our way of playing; our game and we set the rules. This is what toyism is about. Yes. I completely understand, I’ll just have to wait until 2042 then. Now that you speak of all the details it makes me want to see one of the paintings even more. They are all the questions I can think of now, but I’m sure I’ll have more soon. This has been so brilliant. I’m so excited by this. I couldn’t possibly thank you enough Dejo. I hope to speak again soon. you’ve got here on this post. I am coming back to your blog for more soon.